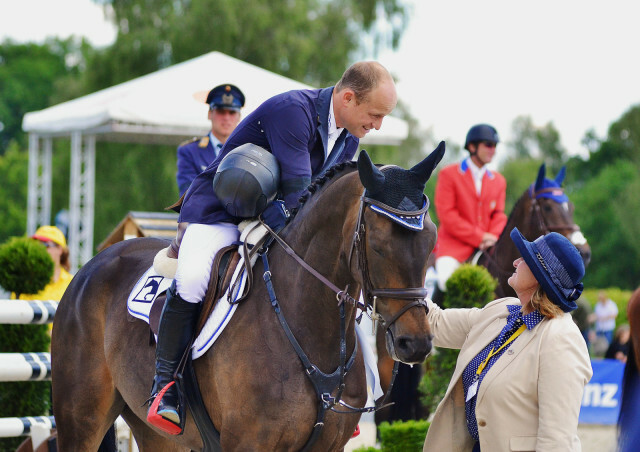 Michael Jung accepts his ribbon from Gillian Rolton at Luhmühlen. Photo by Jenni Autry. The year was 1996, and the setting, the Atlanta Olympics. Australia’s eventing team, comprised of Andrew Hoy, Wendy Schaeffer, Phillip Dutton, and Gillian Rolton, was within touching distance of a gold medal, but it was to take a herculean effort from them all to secure it. Gill Rolton and Peppermint Grove, the ‘ugly big grey horse’ with whom she notched up so many successes – including team gold at the 1992 Barcelona Olympics – weren’t to have a fairytale trip around the cross country. ‘Fred’ slipped and fell, injuring Gill’s arm and forcing her to ride one-handed. Despite this, she remounted and continued on. She fell at the next obstacle, the water jump, but, knowing her team needed her to complete, she once again climbed back on and completed the remaining three kilometres – and fifteen fences – to finish. It was later discovered that Gill had broken several ribs and her collarbone – but the team would go on to win. Gill’s tenacity and determination made her an idol and an inspiration to so many riders, both in her native Australia and beyond. She served as Event Director at Adelaide for 10 years, and has worn almost every hat there is to wear in the sport, from competitor, to selector, to coach, official, and ground jury member. The courage she showed in her riding, and the gumption she exhibited throughout her career kept her fighting through an endometrial cancer diagnosis two years ago. Not to be cowed, she continued her work, even when bed-bound, to a volley of support from her global network of admirers, supporters, and friends. She died, aged 61, on cross country day of this year’s Adelaide CCI4*. To see her indomitable spirit for yourself, check out this #FlashbackFriday video, shared by the Olympic Facebook page. This weekend, channel Gill: swallow your fear, give back to the sport, and enjoy the ride. She certainly did, throughout her remarkable life. If you have trouble watching, click here to play the video directly on Facebook.